CONTROL, the Anton Corbijn directed film based on the life of Joy Division singer Ian Curtis is finally due to be released in the US on June 3rd. 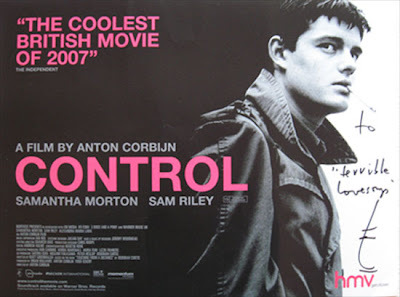 I met Anton back in February when Control saw it's UK DVD release. He kindly gave me a poster and signed it-see, even Anton Corbijn has heard of Chalky's World Famous Terrible Love Songs blog! An excellent film. I still find it hard to comprehend that Ian Curtis was only 23 years old when he committed suicide. This film is well overdue it's US release date, still I'm sure all you US Joy Division fans will agree that it's well worth the wait.